Sales methods used in New Zealand which work? The methods I have talked about in this article are the ones I have either used or have seen being used effectively in New Zealand . The basic challenge for you as a Sales & Marketing Manager is always to continuously identify additional channels that will help to find new markets, and monitize unexplored niches. The methods I have listed below are going to help you do that. Past clients – Keep in touch with existing customers as they are always a great place to start. Use a basic CRM system which can be part of your accounting or quoting process. Check it monthly, follow up and identify non performing accounts. Remember your existing customers have already bought into your product and services and are most likely to use you again. I often see large companies forgetting to go back to their customers once the service/product is delivered, and automatically assume that the prospect will come back to them for the next purchase cycle. A change in budget or the decision maker might see you overlooked for the opportunity. Build a partnership referral system – This is one of the most underused processes in sales & marketing development. Good partnership referral system is worth its weight in gold. Not all incentives are monetary; I have found that good relationships, common sense and business ethics help deliver good results. Personal Network – most of us start this with a bang. One should continuously explore new options within active demographic regions. Always try to grow into your trade related networks that have branches in different cities. Paid speakers – Gives you the opportunity to promote yourself as a brand and become an information/content champion. A good speaker is always sought after by companies and associations, giving you the opportunity to present your view point directly to a large group of potential customers in one room. Word of caution don’t overdo self-promotion as it may back fire. 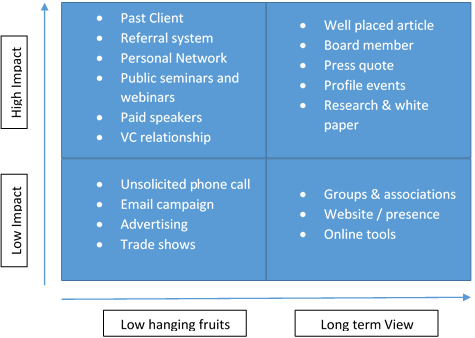 VC relationships – money follows money, there is always someone looking for new skills and services and VC are a great controller of recommendations. Unsolicited phone call – Cold call is a great chance to capture and talk directly to the final user, but done badly can have negative repercussion to your brand and offer. Do get your database in order before you start the calling process. Your expectation of the target market may be different to what the actual sales cycle will deliver. Always test your message and the sales closing process to avoid confusion at the customer services level. Trade show – Very market and product specific tool. Do extensive market research and identify purchase cycle of your vertical/niche. Reconfirm the customer traffic to the particular trade show you’re planning to attend. Phone a few potential customers to see if they attend such shows. Having a stand in the wrong trade show could turn out to be an expensive exercise with little to no returns for you. Frequent press quote – As an influencer, your perspective is a case to change trends and advice users of habit expectations. If done well, you will generate a substantial sound bite into your target market. Publish white papers and research – As a content and subject matter expert your advice and suggestions are sought after by many and will help in influencing them to align your services for consumption. Groups and associations – Very time consuming in finding the right set of members. It sometimes takes too much personal commitment and not as much return on investment as you would expect. Online tools – Search words, back links – Low cost , time consuming acquisition method which are helping the small business stand up against the might of the big business. Use this to create as much disruptive marketing as possible, but always keep an eye on the clock and wallet in terms of time and dollar spend for each converted lead.